Tesla Model 3: Do the positives outweigh the negatives? There are good and bad aspects of every car. What's most important is figuring out your priorities and deciding if the pros are so positive that the cons seem trivial. If the negatives are going to bother you enough to make you second guess your buying decision, perhaps you should have reconsidered. The problem is, with all the mixed reviews out there when it comes to cars -- and especially the hugely popular Tesla Model 3 -- it's hard to know for sure what you're getting into. Moreover, it seems that Tesla vehicles are forever adapting as time moves forward, which doesn't make your decision any easier. Fortunately, YouTube channel Crosstalk Solutions has what appears to be a "newer" Model 3. In fact, it's only been on the road for about 3,000 miles. We think that's a pretty reasonable amount of time to make some solid observations about the car's pros and cons. So, what does Chris Sherwood from Crosstalk want us to know? For more in-depth insight, watch the video above. Do you own a Tesla Model 3? If so, let us know if you agree with these lists. If your list is different or you have something unique to share, fill us in via the comment section below. 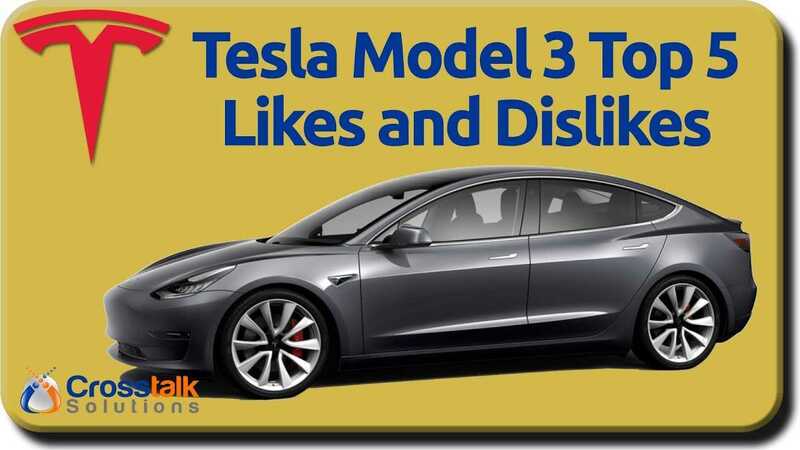 I've driven the Model 3 for about 3000 miles now, and this is my list of top 5 likes and dislikes about this vehicle. What is your list? Let me know in the comments below!